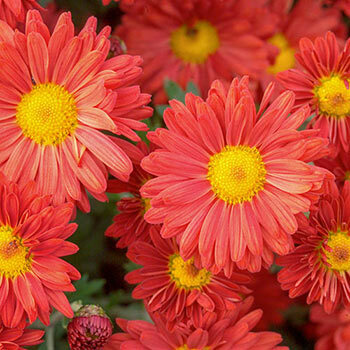 Such bold red color looks outstanding on a plant that completely blankets itself in blooms! 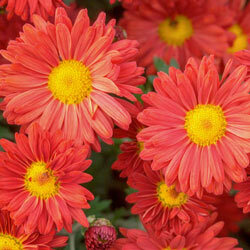 Red Daisy Mammoth Mum is actually perennial, and grows in a tidy mound without the help of pinching and pruning. That makes this a great option for lasting structure along a border. It'll stay for years—reaching its mature 3-foot height in and 5-foot spread in about 3 years. Each fall, when your summer display has faded, this reliably brings floral beauty back into the garden. Bred by the University of Minnesota's program for groundbreaking hardiness, thriving all the way up in zone 3! 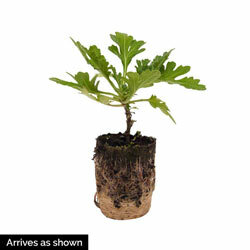 Foliage Type: Aromatic, alternate deeply lobed, dark green leaves, gray underneath. Shrub type.